The same Biafra you Nnia Nwodo and Dave Umahi plotted with other governors to destroy through Operation Python Dance? Hypocrisy is a very dangerous state of being. You have been warned by IPOB never in your useless sabo life to organize any Ohaneze Ndigbo event in Biafraland. If you think we are joking go ahead and organize an event and watch how you will be disgraced. This time around our mothers will not let you escape. You claim you are an intellectual but you invited Hausa Fulani soldiers to kill the same people fighting for your liberation. How many times did Afenifere ask Fulani Islamic soldiers in Nigerian Army uniform to invade Yoruba land to kill OPC members? Have you not seen the level of support Yoruba elders and politicians gave Gani Adams the leader of OPC? Have you forgotten that OPC were violent yet Yoruba politicians like yourself embraced them. Animal like you! We will never forgive you. The Radio Buhari International (rbi) you helped establish with the help of natural born greedy fools is an everlasting testament to your treachery. 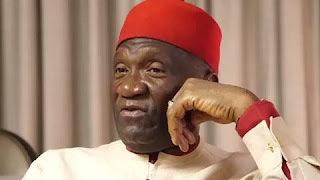 You will be remembered as the Igbo leader that stood up in Lagos and boasted that he will sabotage Biafra again. The video of your speech is in existence so you can’t deny it.